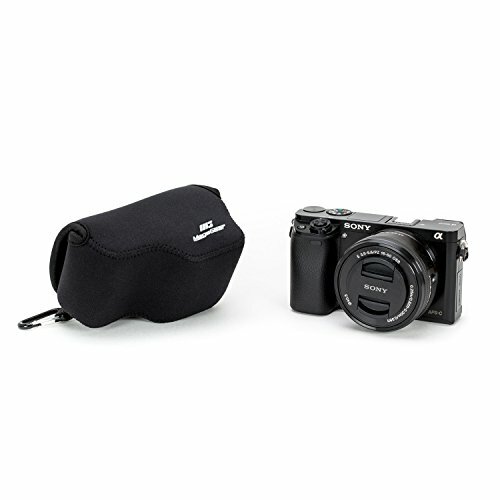 I was looking for a form-fitting case for my new sony a6000 with 16-50mm kit lens — I wanted something to prevent it from being scratched, and to prevent it from scratching other things when I was carrying it in my purse. This does the trick. It stretches to fit snugly over the camera – I doubt that I could fit the camera in the case if I had a bigger lens on it. (But if I put on a bigger lens, I doubt I’d be carrying it in my purse anyway.) 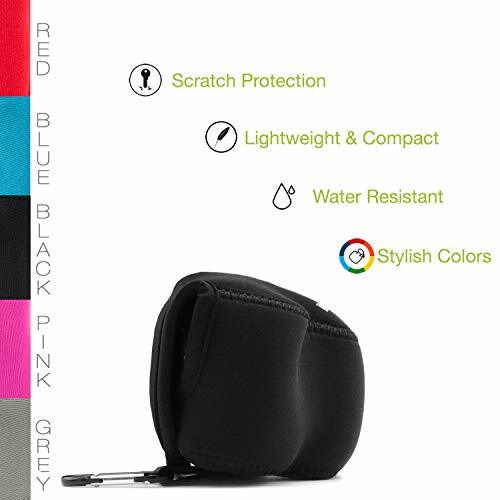 This is *not* the case I’d buy if I wanted cushioned protection for my camera. I have a lowepro bag for that. 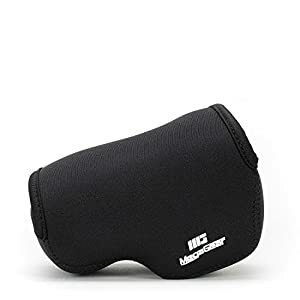 But for some lightweight cushioning/ scratch protection in a form-fitting case, this is just fine for me.Looks like most of the complaints are about velco/ construction. I’ve only had the case for a few days so haven’t put it to hard use test yet, but construction so far seems fine to me. Not fit at all for your A6000! 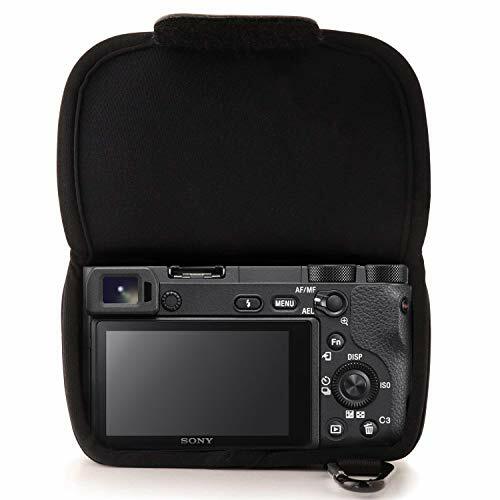 I do NOT recommend this case for Sony A6000.However, I am keeping it for my other camera (Sony NEX-5R) which was surprised to be a perfect fit…. 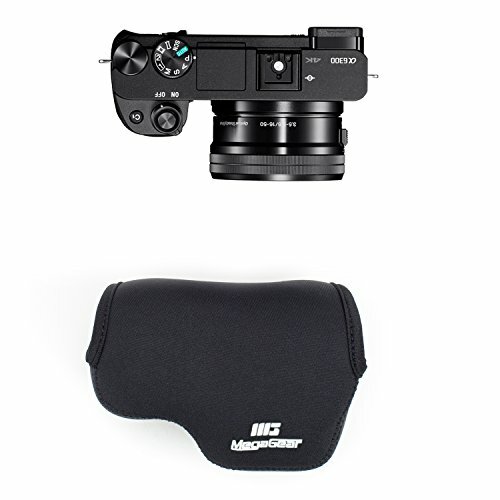 I highly recommend MegaWest to chane the description from “A6000” to “NEX-5R”. I never write reviews, but I feel compelled to throw my opinion in the ring. 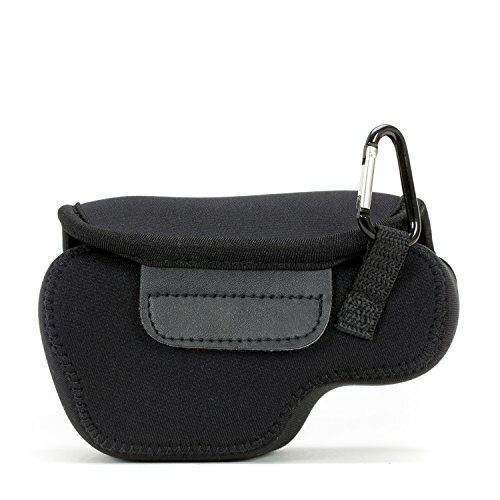 I was looking for a slim, simple cover for my a6000 when I’m carrying it in a courier bag. Something as small as possible, just to protect it a bit from scratches and dust and minor bumps. Normally it lives in a real camera bag when I’m out shooting and bringing other lenses, etc. 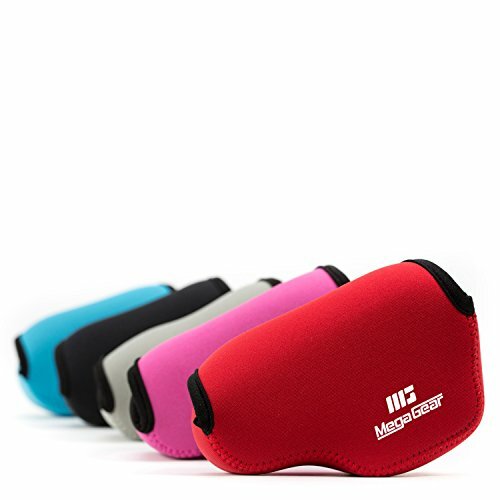 Previously I tossed it into an old goggle pouch but it wasn’t nearly protective enough, and the rubber eyepiece got caught on the material.Many reviews made this MegaGear neoprene case seem like it was going to be disappointment: too small, too annoying, poorly made, not enough protection. So much so that initially I went with another option (which I hated and returned, but that’s another story). I have to say for me, this case is nearly perfect.Is it snug? Yup. When I first pulled it out of the box I thought “Oh, I see what they mean.” But it actually stretches easier and further than expected. The velcro matches up well and holds more securely than expected.Is it a little tough to get on and off? More so on than off. Off is actually pretty quick. So far, getting it on is a bit of work. I assume I’ll get better at it but for now it’s a brief wrestling match. 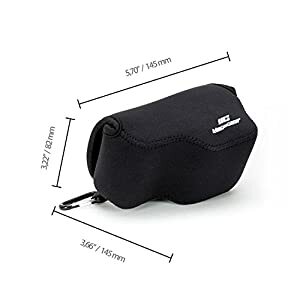 If you hope this will be your camera bag while you wander around somewhere, occasionally taking pictures every few minutes, this is not for you. You will be annoyed if you expect to be constantly removing and recovering your camera. 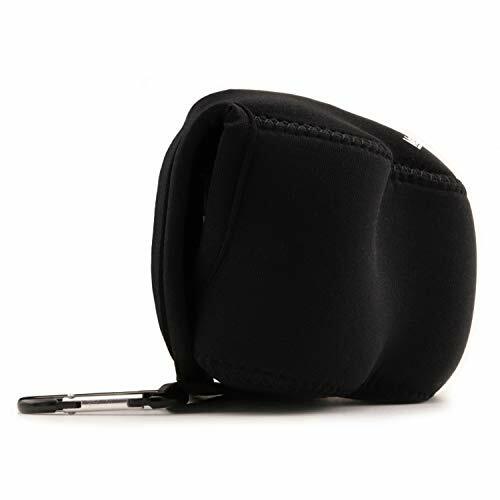 But for me, it’s perfect for protecting my camera when I toss it into a larger bag. It adds nearly zero additional bulk to the camera. It goes on when I’m not using it, and if I go out shooting, it stays in the courier bag, or home, until I’m done shooting.Is it poorly made? A little early to tell, but it seems good so far. As previously mentioned, the fit is better than expected, and the velcro seems more solid and effective than I had feared. I agree the carabiner loop should not be relied on, but that is mostly because by using it you are asking the neoprene material to be the weight bearing element, and it’s not designed to do that job. It will rip. But even so, the loop is stronger that I thought it would be. But I still wouldn’t hang the camera from it. I will probably remove the carabiner entirely.Is it thin on protection? Not for me. It’s perfect for what I want: a small amount of bump and bruise protection with minimal bulk. If I drop the camera in this from 4 feet will it protect it? Probably not. That’s asking a lot from neoprene. Will it protect it when I plunk my courier bag down on a table? Absolutely. And that is what I was looking for.In short, if there was 4.5 stars, I would give it that. The only knock I have against it is that if they modified the shape a tiny bit, it would better cover the eyepiece and movie record button. PROS: a) Nicely padded, non-rigid but decent protection against impact and scuffing if you wish to carry your a6000+16-50 zoom (or any other compact camera+pancake wideangle) clipped to your waist at all times; b) Velcro closure is very secure so no worries about camera inadvertently dropping from waist level to the ground.CONS: a) Tight fit, fairly easy to withdraw camera from case, but putting it back for storage is a time consuming chore requiring BOTH ungloved hands; b) unless you’re willing to run the risk of shooting with a completely strapless camera, attaching a small wrist strap to one of the lug rings becomes almost mandatory, as a shoulder strap of any length will have to be folded up for storage, adding unwanted bulk to the contents of case; c) all surfaces of case, both inside and out, are a magnet for pet hairs, which will stand out visibly against the dark fabric and are tedious to pluck off. I ended up abandoning efforts to squeeze my a6000 into the confines of this case. Use it now solely for carrying miscellaneous small photo accessories on my waist.